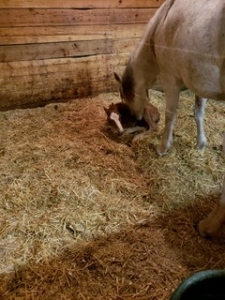 This little filly was born to a sweet, surrogate mother! Her Sire is the $2 million dollar producing stallion Walla Walla Whiz and her dam is Jac and Sara (aka Sugar proudly owned by Mountain View) Sugar’s dam has produced $60K and Sugars sire Jacs Electric Spark has produced earnings of $3 million. This little girl has a bright future! We’re thinking of naming her Petro. Meet Megan and Shine. Megan has been with the barn and taking lessons from our esteemed trainer, Laura, for some time. Megan just bought Shine who is a 14 y/o, 15.3 hh quarter horse who, coincidentally, shares the same birthday with Megan’s youngest son. Shine was a dressage horse for years but has been trained in western pleasure the past three years. He’s a little spunky and some would say a little spoiled too! Megan loves to ride and hang out with Shine; being with him lets her relax and forget about any cares she may have. 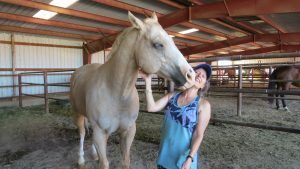 While the pair are still getting used to one another, ultimately Megan wants a horse that is safe and a pleasure to ride and to get to the point where both of them live up to their potential. Looking forward to seeing you guys grow together Megan! Marilyn and Larry (the horse) along with Bob and Donna. 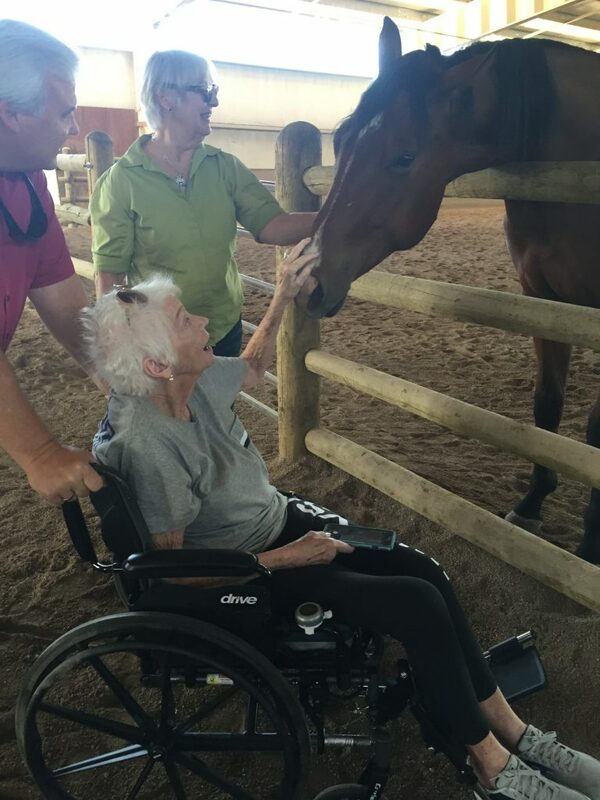 We love having visitors at Mountain View Ranch and Stables and, one Friday, Laura (our wonderful trainer) invited her mom Marilyn and her brother Bob to visit and have some lunch with us. Marilyn used to travel with Laura and her horse to her events and would help with grooming, tacking up and taking care of her horse. Today was a poignant moment because Marilyn hadn’t been around horses for some time and was simply delighted when we brought the horses in one by one to say hello to her. Larry (the horse) pictured here is our gentle giant of only 2 years of age. We purchased this history-rich facility on November 15, 2013– and are extremely excited for this new opportunity. My wife Leesa and I are relocating from north of Seattle, WA- where we have spent our lives on an active dairy farm milking cows and farming just over 160 acres. Our son Matthew and his wife Elizabeth have been living in the Denver Metro Area for several years, and are expecting their first child this winter. They have long told us how much they love Colorado, so we are looking forward to being closer to them and enjoying all that this area has to offer. As third generation farmers, we understand the importance of commitment, relationships, and work ethic to the success of any business. 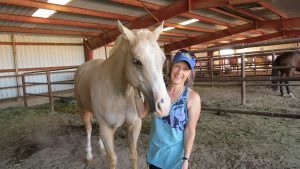 We see so much opportunity to continue to grow the legacy of Mountain View Stables, and ensure the stables are the premier boarding and riding establishment in the Northern Colorado Area. We are eager to get to know each of you, and desire open communication on how we can better your experience at Mountain View. 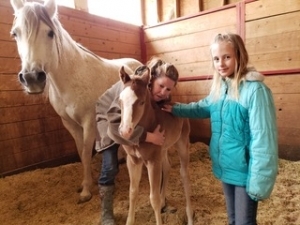 We look forward to continuing the relationship you have with Mountain View Stables, and working together to meet all your boarding and riding needs. We will be reaching out again to invite you to a get-together where we can get to know each other and further discuss the future of Mountain View. If you have any questions or concerns, please don’t hesitate to reach out to us at our contact info below. https://mvsaa.com/wp-content/uploads/2016/08/hugelogo-300x130.png 0 0 Janet Steward https://mvsaa.com/wp-content/uploads/2016/08/hugelogo-300x130.png Janet Steward2016-07-29 16:26:562016-08-19 19:43:57New Ownership!